SysAid > Company > Newsletter > Issue 56: So Who Won the iPad 2 SysAid Raffle? For months now we've been talking about the IT world going mobile, and how SysAid is right there assisting you in that direction. To back up our position, we held an iPad 2 Sweepstakes a couple of months ago, where the winner was destined to receive brand new iPads for each member of the IT team. I am particularly pleased in the outcome of this promotion, as it gave SysAid an opportunity to not only spread IT mobility capabilities, but also to contribute to a most worthy cause. 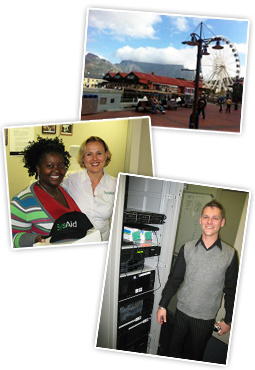 The joy of meeting our customers and the excitement of handing out the iPads was extraordinary, according to Sarah Lahav, SysAid’s VP Customer Relations, who travelled all the way to South Africa for a very memorable trip! And the Winner Is...Drum Roll Please...mothers2mothers! We are thrilled to announce that the winner of our iPad 2 Sweepstakes is the 6-member IT team at mothers2mothers, a South African-based non-profit organization, which provides education and support for the prevention of mother-to-child transmission of HIV. > Read more about m2m's double win! In line with our ambition to take SysAid to the next level with every single release, we held a few internal brainstorming sessions to figure out how we'd like to deliver the SysAid experience going forward. A fine-tuned value proposition evolved. In just two weeks, SysAid Academy will be holding its next free live video webinar. Join us and learn from our top technical experts how you can discover all your SNMP devices inside your organization, and catch traps when something goes wrong. > Space is limited, so register now! Do you monitor your SNMP devices with SysAid?